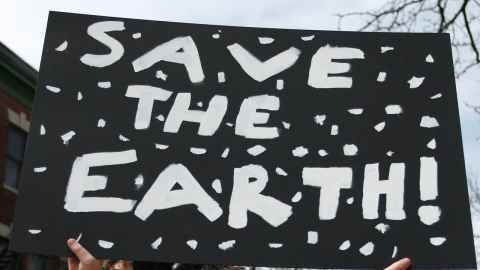 Opinion: School kids striking in protest at climate change will one day look back at us and question why we thought doing nothing was okay, write Professor Shaun Hendy. When my great-grandmother was just a kid, the world knew that carbon dioxide was a greenhouse gas. That was great, because carbon dioxide let sunlight through but then trapped heat from the Earth before it escaped into space, helping to keep us warm. When my great-grandmother met my great-grandfather, the world knew that it was burning two billion tons of coal every year, which released seven billion tons of carbon dioxide into the atmosphere. That was okay, because we knew that water vapour was also a greenhouse gas and there was already plenty of water vapour in the air. A bit more carbon dioxide wasn’t so bad. When my grandfather was just a kid, the world knew that carbon dioxide absorbed heat in parts of the spectrum that water didn’t, filling a gap in the greenhouse blanket through which heat could escape. That was okay, because we thought that carbon dioxide from fossil fuels would be absorbed by the oceans rather than stay in the atmosphere. It would take many centuries before the world started to heat up. When my mother was just a kid, the world discovered that carbon dioxide was mainly being absorbed at the surface of the oceans, not enough to keep up with the growth in our emissions. Things might be okay, but only if the gas was being absorbed by forests and soils and not ending up in the atmosphere. When I was just a kid, we knew that carbon dioxide levels were rising in the atmosphere, steadily year on year. This was probably not okay, but we had yet to see temperatures rise in response. We still had plenty of time to act. When today’s kids strike, they do so knowing that politicians, energy companies, and billionaires conspired with their parents to do nothing. They will know that catastrophic climate change is a possibility and that their lives may be considerably worse than ours. When I first met my wife, we knew that global temperatures were rising and that it was because of us. This was definitely not okay, but if we acted, we knew we could limit climate change and the resulting sea level rise to manageable levels. When today’s kids strike, they do so knowing that politicians, energy companies, and billionaires conspired with their parents to do nothing. They will know that catastrophic climate change is a possibility and that their lives may be considerably worse than ours. They know that this is not okay. These kids can’t yet vote, they can’t stand for office. They know that their protest today won’t avert climate change. But seriously, how else can they tell us that things are not okay? In decades to come, when their kids miss school because they were evacuated ahead of a bushfire or because their classrooms needed to be rebuilt on higher ground, they will know that it is bloody-well not okay. They will wonder what on earth we did at school that we went on to vote for politicians who could look at a century of science and claim there was still a debate. That we tolerated billionaires and energy companies undermining our democracy with misinformation and astroturfed doubt. I have heard and read all sorts of excuses for why our kids shouldn’t protest: the strike is meaningless virtue signalling. They should learn civics instead. They just want a day off school. What excuses do you think they will make for us? Will they look back sympathetically and say that we just didn’t know? That we honestly believed things were okay? Shaun Hendy is Professor of Physics in the Faculty of Science and Director of the Te Pūnaha Matatini. This article reflects the opinion of the author and not the views of the University of Auckland. Used with permission from Newsroom Climate change - the kids know it’s not OK published on 15 March 2019.